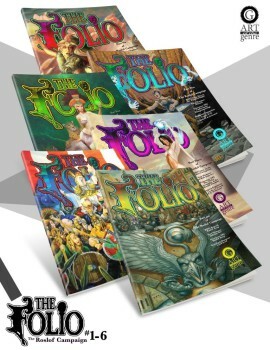 Folio 1-6 once again available in print! Today marks several large releases for Art of the Genre. The small press has recently restocked its The Folio: Roslof Keep Campaign books and now has them all available at their online store both individually, and in a package containing all 6 issues from 2015. 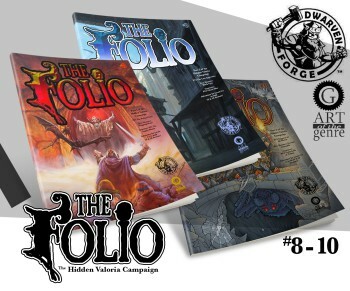 In a homage to TSR‘s Dungeon Magazine, The Folio combines incredible masterwork covers (featuring the likes of Jeff Dee, Jeff Laubenstein, Daniel Horne, Jim Holloway, Todd Lockwood, and David Martin thus far) that can be fully removed like the classic TSR modules of the 1970s & 1980s, along with detailed 3D maps, ‘Blue’ OSR maps, a fully formed campaign Gazetteer booklet and Dungeon booklet. Named for former TSR artist and art director Jim Roslof contribution to the cover of B2 The Keep on the Borderlands, this first campaign set takes characters from 1st thru 12th level in both 1E AD&D and 5E mechanics. If you’ve ever enjoyed campaigns the likes of Against the Giants, Bloodstone, or The Temple of Elemental Evil, then this is for you! This series has been run exclusively on Kickstarter to this point so it is with great excitement that AotG now has the ability to offer these to all those who missed it. Copies can be purchased as a single unit or issue by issue, and remember all are in shrink wrap to keep them in mint condition. Interior adventures include: ROS1 Beneath Roslof Keep, ROS2 Tremors in the Machine, ROS3 Curse of the Violet Corruption, ROS4 Glade of the Burning Dead, ROS5 Deep Dive into Flooded Halls, and ROS6 Realms of Madness and Despair. The AotG website also includes digital bonus supplements for the campaign to help flesh out world and parties as they explore Mithelvarn’s Labyrinth and match wits against the Infernal Machine that drives it. 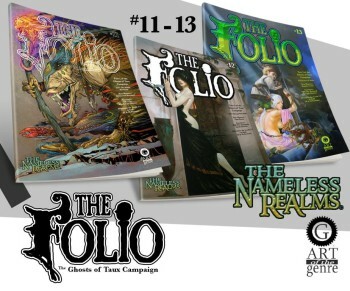 Coupled with the announcement of this release, AotG has also provided an incredible preview of two module trilogies for 2016 that can be pre-ordered with a Folio Subscription. Press releases for these promise the following. The Hidden Valoria Campaign: Come join the adventure inside the Dwarven Forge world of Mythras! Whether you are a terrain enthusiast or not, The Hidden Valoria campaign features great gaming for 1E & 5E players of levels 1-8. This trilogy will feature the same 3D maps, removable covers, interior booklets, and fantastic art of the previous editions with a great opportunity to build a physical representation of the campaign if you so desire! Release dates April, June, and August 2016! The Ghosts of Taux Campaign: Born from the minds of a dozen award winning novelists, Taux, the City of Whispering Stone, has thus far only been the setting for the anthologies Tales of the Emerald Serpent and A Knight in the Silk Purse. Now, however, fans of the Nameless Realms can explore the city firsthand while rubbing elbows with famous and infamous characters. Another trilogy, The Ghosts of Taux, will be a story driven adventure for more experienced characters ranging in levels from 3-9. This also will incorporate races originally printed in The Roslof Keep Campaign. Release dates September, November, and December 2016! But they don’t seem to be done yet! Couple all the above with the announcement of a partnership with Pinnacle Entertainment and their Savage Worlds setting and suddenly you have an already buzzing Folio #7 Kickstarter. This Folio features an incredible cover by TSR master Keith Parkinson and is bound to the Deadlands: Hell on Earth setting! One thing is for certain, AotG is gearing up for a record breaking 2016 that should have old, new, and on the fence role-players happy for the state of the industry and the opportunities for adventure. I’ve been a steady supporter of Scott & AotG’s Folio series and recommend them highly to old school gamers (and new ones too). In fact, I plan on running the Folios 1-6 with 5E rules this summer. The art is great in these modules and if you’re old school you’ll enjoy all the visual references to early TSR art. Scott, you can expect me to sign up as a subscriber for this year.